A list of famous people from Bangladesh, East Bengal. 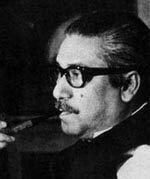 Sheikh Mujibur Rahman (1920-1975) Sheikh Mujib is widely regarded as the ‘founding father’ of modern Bangladesh. 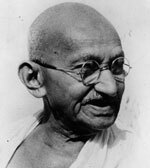 In the pre-independence years, he was a strong advocate of socialist policy and ending discrimination against Bengalis. After the War of Liberation, he served as the first President of Bangladesh and later the Prime Minister. He was assassinated in 1975 by junior army officers. 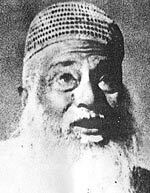 Abdul Hamid Khan Bhashani (1880–1976) Bhashani was a leading Muslim advocate of Bengali independence. He was a committed socialist becoming popular amongst the poorest sections of society. 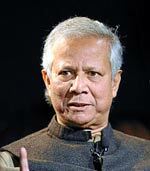 His boycott of the 1970 election was instrumental in fermenting the Bangladesh independence movement. Sheikh Hasina (1947-) Hasina has served as Prime Minister from 1996-2001 and from 2009. She is the eldest daughter of Sheikh Mujibur and is head of the Awami League. 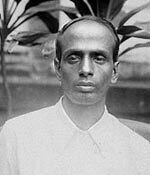 Surya Sen (1894 – 1934) Born in Chittagong, Surya Sen was a leading Indian nationalist, elected President of the Indian National Congress in 1918. In 1930, he led a raid on the Chittagong armoury, where he hoped to proclaim Chittagong independent. He escaped but was later caught and executed in 1933. 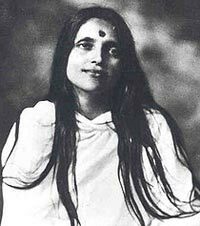 Sri Anandamayi Ma (1896 – 1982) a Hindu saint from Kheora, Brahmanbaria District, Bengal (modern day Bangladesh). She frequently slipped into divine ecstasy and attracted numerous followers, inspired by her spirituality and simple teachings. She frequently travelled offering bhajans and meeting seekers. Sri Chinmoy (1931-2007) Spiritual Teacher born in Chittagong, Bengal, Sri Chinmoy came to the US in 1964. He established meditation centres around the world and created the Sri Chinmoy Oneness-Home Peace Run, and other initiatives for world peace. Rabindranath Tagore ( 1861 – 1941) Indian poet, born in Calcutta, Bengal. Tagore was the first Asian to be awarded the Nobel Prize for Literature (1913) for his work – Gitanjali. Tagore composed the national anthem of Bangladesh Amar Shonar Bangla.